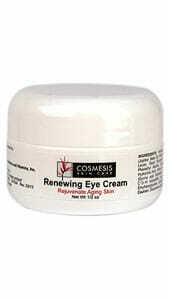 Cosmesis Skin Care Renewing Eye Cream’s active ingredients helps to reduce the visible signs of aging around the eyes. 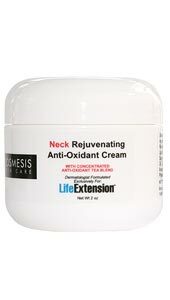 Supports moisturizing & firming the skin to help reduce wrinkles and fine lines. Helps you to look 6 years younger in less than a month! The thin, delicate skin area around your eyes is extremely susceptible to the visible impacts of aging, such as wrinkles, crow’s feet, fine lines, and bags. 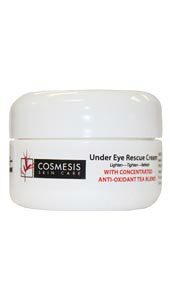 Oxidative and environmental stress gradually breaks down the elastin and collagen resulting in more fragile skin around the eye area. Renewing Eye Cream promotes firmer skin and helps maintain natural hydration. 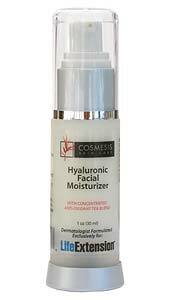 It also smooths and minimizes the appearance of fine lines and wrinkles. Ingredients: Purified Water (Aqua), Simmondsia chinensis (Jojoba) Seed Oil, Prunus armeniaca (Apricot) Kernel Oil, Glycerin, Levan, Decyl Glucoside, Olea europaea (Olive) Leaf Extract, Phenethyl Alcohol, Zizyphus jujuba Seed Extract, Squalane, Hyaluronic Acid, Arnica montana Flower Extract, Oxido Reductases, Glycine soja (Soybean) Protein, Hydrolyzed Rice Bran Protein, C13-14 Isoparaffin, Laureth-7, Polyacrylamide, Phenoxyethanol, Ethylhexylglycerin, Concentrated Tea Blend Extract. Place a small amount on finger and apply to area surrounding the orbital bone, tapping in gently. 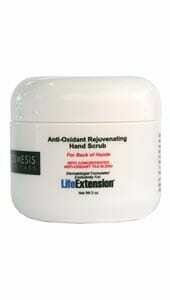 Warnings: Discontinue use if redness or irritation occurs. Do not ingest. Keep out of reach of children. For external use only. Avoid contact with eyes. If product contacts eyes, rinse thoroughly with water. Not tested on animals. 2. Available at: http://www.kinetiktech.com/brochures/pdf/rahn/PROTEOLEA-Leaflet.pdf. Accessed April 29, 2013. 3. Sci Pharm. 2010 June;78(2):133-54. 4. Available at: http://www.realbio.com/file­_downloadphp?nfile=1_1266480435.pdf&ofile=Levan-Application+and+Perspectives.pdf&b_code=101. Accessed April 29, 2013. 5. Efficacy of oleuropein against UVB irradiation: preliminary evaluation. 6. Olive leaf extract and its main component oleuropein prevent chronic ultraviolet B radiation-induced skin damage and carcinogenesis in hairless mice. 7. Multiple antimelanoma potential of dry olive leaf extract.